The boy was talking very fast and trying his hardest to impress his six-year-old sister Catherine. He knew it was his job and duty to not only take care of her but to entertain her as they walked back from the home of their older and married sister. Catherine was the youngest of twenty-five children since her twin had died shortly after birth and was a treasure to the family. So, he joked with her and told her stories so that the journey home might be a little easier on her. When he turned to see why she wasn’t responding to his best jokes and funniest voices, he noticed that she was no longer walking beside him. Like a good brother, he was instantly terrified that he had lost his youngest sister. He began to look around frantically while yelling at himself for his negligence and carelessness. He was gripped by that horrible combination of certainty that she must be nearby and confidence that an awful mistake has been made that will exact a terrible cost. When he didn’t see her in the immediate area he began to sprint back on the path they had been traveling. He finally found her standing in the middle of the road and staring up into the sky with tears streaming down her face. He knew that those tears–probably tears of fear at being lost, he suspected–would purchase his punishment with their father and so he began to think of a way to dry them up along with any story Catherine might be tempted to tell before they got home again. He called her name sweetly but she didn’t adjust her gaze away from the blank spot on which it was focused. He became frightened and called out to her louder and more harshly yet she still mouthed silent words with her eyes focused on some invisible subject. When he grasped her hand, she suddenly gasped and seemed ripped back into the world she shared with her family and the rest of humanity. Six-year-old Catherine began speaking of seeing the throne of Heaven with Jesus seated upon it. Around him were Peter, Paul, and John and they joined together with others in worship. The little girl who was nicknamed “Joy” by her family had been overwhelmed by the joy that radiated from the communion and unity of that glorious scene. Even telling it to her brother had an infectious nature and when they got home her family found this to be a miraculous vision of things unseen. This little girl would commit then and there to a life of devotion to the one who had inspired such joy and peace by his mere presence. She would go on to become a leader in the Dominican monastic movement among the devoted laity. Her appointment was not without controversy but it is undeniable that she was called to and suited for this position of service. When she grew older she was pushed toward marriage by her family. They had raised her in the Faith that they professed alongside her but it seems that Catherine’s childhood vision had faded in their minds over the years while it still burned white hot in her own. When they began to speak of marriage and betrothal, she took a shocking action and cut her long, beautiful, golden-brown hair to a strikingly short length. She was punished for this act and forced to do menial tasks around the home and denied the solitude and silence she craved so eagerly.Yet, it was through this punishment that she learned to find solitude within herself–deserts that could not be denied to her and always held the promise of the presence of God. Eventually, she had another vision wherein she was brought up to heaven by Jesus himself. Once there, she was betrothed to Jesus. He slipped a ring upon her finger to seal her as his and she was taken back to the world she knew and shared with her family. From that day onward she said she could always see the band upon her finger even as others claimed that nothing was there. Georgios Aggelopoulos was born to a poor family in Dimitsana, Greece, in the year 1746. Like so many of his contemporaries, he seemed destined for a fairly forgettable life comprised mostly of hard work, limited rewards, and devotion to the Church–this ended up being true but not quite in the way that we might expect. Georgios received a decent education but his own natural talents and aptitudes propelled him forward so that he was able to study in Athens for two years. His uncle was an influential man in Smyrna, however, and arranged for Georgios to receive a high quality education there not because of any ability to pay but rather because of his surprising intellect and in spite of his many obstacles. Georgios’ family expected that he would go on to a career in academic circles and this would have been a surprising career for one of his background. Yet, it was his commitment to the Church and monastic spirituality that would hold most strongly when presented with other callings. Georgios became a monk and took the name of Gregory. As a monk he finished his education before becoming first a deacon and eventually an archdeacon in the Church in Smyrna. I’m always amazed at what donuts can accomplish. There’s always a little anxious energy in the hour before one of the occasional events that we host. That energy is amplified when we’re having an open “work day” at our Urban Farm. It’s always hard to say what the weather is going to be like and we’re rarely certain just how many people will show up. 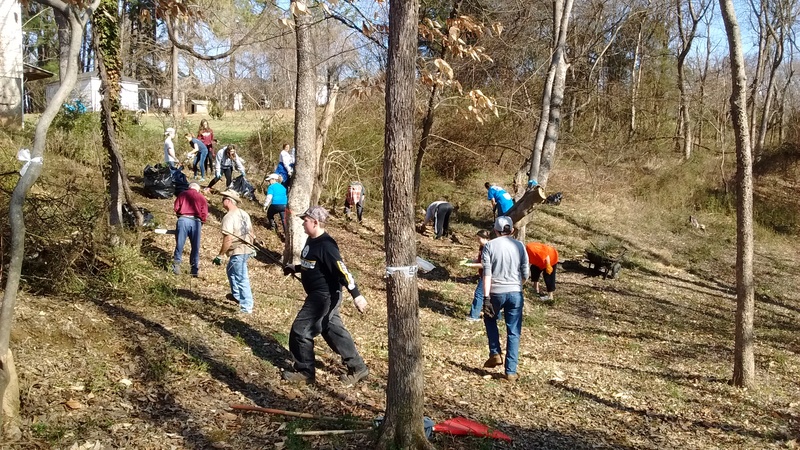 Our February work day with CBFVA congregations and personnel was no exception. As the members of Grace and Main gathered early to go over the plans one more time before everybody got there, there was still a faint, anxious buzz. So, we did what we’re good at. We put out cider donuts made hot and fresh that morning. We put out the big coffee pot and some creamers, including some cashew milk shared with us from the neighborhood when they heard we were going to have a work day. We laid out extra gloves and stacked some tools against a nearby tree. We checked to make sure we had remembered to bring prayer books for our guests to use before lunch. We kept an eye on the hill that we knew the vans would soon come down and made sure bottles of water were cold and there was sunscreen set out for those who forgot theirs. In short, we practiced hospitality and let the donuts and coffee get ready to do their part of the work. Our little, intentional community has committed itself to the practice of hospitality, (among other things). But hospitality is not only opening our homes to provide space for others to rest, eat, and share life. It is also about opening our lives and making room for the other—whether they be people experiencing homelessness, people in need of a listening ear or a cup of coffee, or vanloads of volunteers who are coming to work in our gardens. Hospitality isn’t only something we provide, but is something we receive as well. We receive hospitality when we find a seat on somebody’s porch and catch up over tea, or when we are welcomed into a neighborhood by people whose family has lived there for generations, or when loving hands plant seeds though they may not see the produce when it is harvested. When the first vans came down the hill, I said a quick, silent prayer of thanks and hope. As they unloaded, found the bathrooms, marveled at how incredible the donuts were, and refilled their coffee cups, the buzz of anxiety faded—the donuts had once again accomplished something amazing. 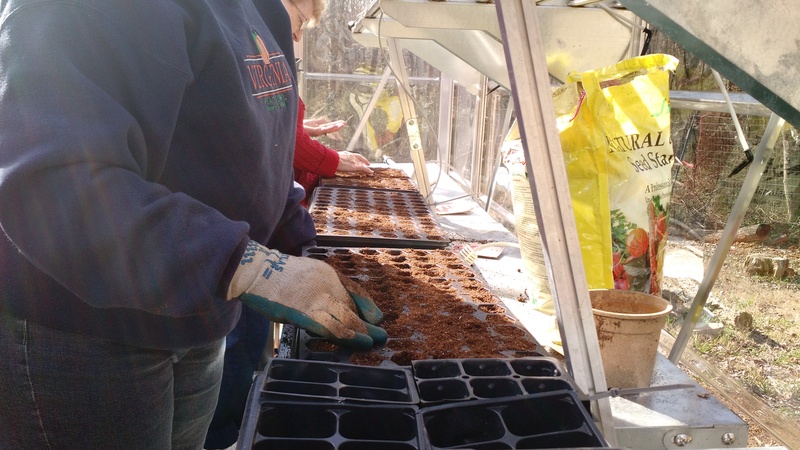 Friends from Roanoke, Oak Level, Richmond, Halifax, and Danville began good work planting hundreds of seed starts in our greenhouse. Many of the seeds they started will end up in gardens all around the city, not just the gardens at the Urban Farm. We cleared brush and prepared the part of the property that will soon become a neighborhood “commons.” A few lovely people helped us to put gutters on the new tool library and get our rain water catchment system installed to make sure that our gardens have plenty of water. A host of fasting teenagers—nearing the end of their “Thirty Hour Famine”—built a stone and dirt swale to redirect water toward our new retaining pond. These good people collected stones from ditches, steadily removed trash from a hillside, and helped us to participate further in what God is doing in our midst. We stopped for midday prayer before lunch and gave thanks for all that had gone well that day and all that was still yet to happen. We joked and laughed and daydreamed about other things that we could do on the land. We talked about how the mushroom logs produce mushrooms, about the process to change our city’s zoning codes to allow for our work (and now the work of several other gardens), about how many years it takes the asparagus to come in, about beneficial weeds and insects, about the praying mantis egg sacs we found and carefully transplanted to the garden, and about favorite and least favorite vegetables (mine are asparagus and cauliflower, respectively, if you’re interested). At the end of the day, we waved goodbye to these people who gave a Saturday to good work. With bent backs and dirty hands, they had given thanks for food to eat and people to share it with, even if their hands might not touch the harvest. As the vans ascended the hill away from us, I marveled at how much work they had accomplished in a part of one day and about the careful balance between the slow and steady work to which we’ve committed ourselves and the sudden, short presence of friends from all around. 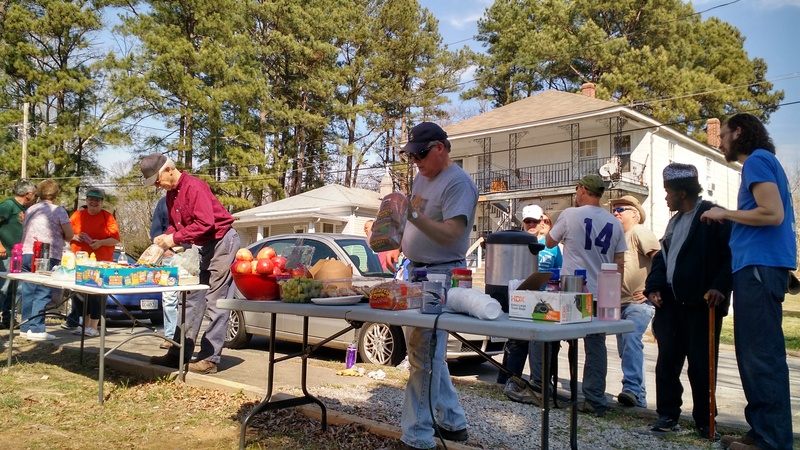 As it turns out, hospitality isn’t just donuts and coffee; it’s also sometimes about welcoming people to participate in community even for just several hours and giving thanks for that offering. We gave thanks for the generosity of congregations and partners around the state who have supported our work with their time, prayers, encouragement, and financial support. There weren’t any donuts left in the box, but they had done such amazing work.